Make Sure That Your Web Cam Works! 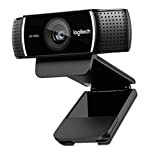 Full HD webcam.1080P network camera supporting 1920 * 1080 high resolution. Can be used for video chatting, high definition picture taking, video recording, creating online classes, and more. Equipped with a manual focusing system. Manual focusing allows the camera to be adjusted to achieve the best focus point for the situation. Manual focus is less convenient, but offers a clearer image and a better quality video chat. The AW615 webcam can be placed on your desktop, mounted on top of your PC, or attached to your laptop. The camera head can be rotated 360 degrees so you can move it around while you are chatting. 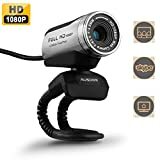 1080p HD sensor and high-precision glass lens: Superior sharpness and 1920×1080P high definition image quality guaranteed, this USB webcam presents a perfect showcase platform for video blogging enthusiasts or YouTube stars. Express yourself in vivid detail like never before. Easy installation & convenient use: Built-in microphone and USB 3.0/USB 2.0 Connector for plug and play. Simply install the driver and connect this HD webcam to your computer and video chat instantly with Skype. Using a webcam you can easily video chat with friends and family around the world . Video-sharing and video chat capabilities are showing up in more devices and more websites and you will probably find it easiest to video chat by using a webcamera with your laptop or desktop computer at home or at the office. In the section below, you can learn some of the basic web camera features to look out for. Then you can choose a web cam that allows you to capture the highest-quality images for either video chat, recordings and even still photos. Megapixels: Webcams, like other types of digital cameras, measure the picture quality by the quantity of pixels that the web camera’s sensor captures in every frame of video or a still photo. A measure such as one megapixel is equal to roughly a million pixels, and it’s very common to find a webcam with more than 3 megapixels. A webcam above 3 megapixels will produce a better picture, but beyond that you may not notice a large difference in image-quality. HD: High megapixels doesn’t necessarily translate into awesome video. Often video resolution on a webcam will be a bit lower than its photo resolution. 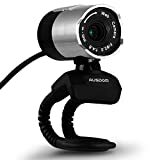 A real HD webcam will record video in 720p or 1080p resolution or higher. For a computer monitor, this is more than high enough to produce crisp, clean video images. Better resolution webcams can take up more system resources while recording, which may be an issue with a very old PC. Video effects: A lot of webcams include different kinds of tools which may feature various picture effects, including virtual foregrounds, text, animations and other extras. These aren’t essential to a web cam, but they can be fun. 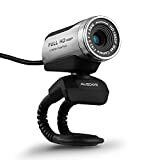 Computer Support: Any webcam you purchase will probably be Windows PC and Mac compatible, you’ll want to check the compatibility of both the webcam drivers that enable your Mac to communicate with the camera and the included webcam software. Placement: You’ll want to place your web cam in a location near your screen so that you’re looking directly, or nearly directly, into the web camera. This gives the appearance that you’re talking directly to the person you video chat with, rather than off to one side. Look for a webcam with an easy attachment clip or mounting base that will provide stability while being easily adjustable. Interface: Most webcams connect via USB cable to one of your computer’s available ports. But a wireless webcam can cut the cable out completely by using Wi-Fi or Bluetooth to connect to your computer. Either method might require that your wireless webcam communicate through a wireless adapter plugged into your computer. Frame rate: Jumpy video can be distracting. More frames-per-second (fps) will create smoother movement as you video chat with friends or family online. Thirty fps or higher will produce smoother video, especially if you have a high-speed Internet connection that won’t introduce lag into your conversations.